Peter and Graeme Pollock are undoubtedly the most famous cricketing brothers to have played for South Africa. They were 28 and 26 respectively when the sporting isolation that ended both their international careers began. The team in which they played was one that was growing in stature by the time the end came, and Australia had just been convincingly beaten 4-0 in a four match series. Perhaps that is the reason why their reputations do not seem to have suffered unduly from, particularly in Graeme’s case, missing out on some of their best years. Largely forgotten now are two other brothers, Eric and Athol Rowan. Like the Pollocks their careers were truncated as a result of matters beyond their control – World War Two – but unlike the Pollocks they seem to have been largely forgotten in the intervening period. Had they enjoyed full careers, particularly Athol, South African cricket history might well be written rather differently. At least Eric had two bites at the cherry. He made his Test debut at 25 in England in 1935, and resumed again at 39 in the home series aginst the same opponents in 1948/49, but there was still a decade lost. For Athol he was 18 when war broke out and had yet to play a First Class match. By 1951, just 30, his career was over, a wartime injury that he had struggled manfully to deal with finally getting the better of him. He did not play cricket again after returning home from the 1951 tour of England. Eric was 20 when he made his First Class debut, and it was a couple of years before he established himself by coming within one run of being the first man to score a century in each innings of a Currie Cup match. Unfortunately by then he had missed the trip that his countrymen made to Australia, so it was 1935 and the South Africans first visit to England for six years before he got his opportunity at the highest level. At the time there was some controversy as to his selection at all. He got the last batting place in preference to 24 year old Dooley Briscoe, who had averaged almost 85 in the 1934/35 domestic season, and had a number of vocal supporters. A fine opening batsman and a smart field was how the pre-tour brochure described Eric. He would have looked back on his trip to England with great pleasure as he helped South Africa to record not only their first Test victory in England, but they went on to take the series as well by virtue of their win at Lord’s. For Eric there were solid contributions of 40 and 44 to the famous victory, and in the next Test his side might well have lost had he not contributed a defiant 62 while all around him failed. But overall his series record of 246 runs at 27.33 would have disappointed him. In the less rarefied atmosphere of the other tour games however he was the leading runscorer by a distance, with 1,948 runs at 44.27, including six centuries. Wisden, in its 1936 edition, summarised Eric as being A quick footed attacking batsman, excelling in the cut. A rather more thought-provoking observation was that He did not bat either with dignity or precision; he regarded his cricket in most light-hearted style, but his confidence was amazing. His fielding, like that of several of his teammates, also drew praise and was described as …. always good to watch. Soon after they returned from England the South Africans had the challenge of an Australian tour of the Cape for the first time. Stale after playing cricket more or less continuously for a year the Springboks had no answer to Clarrie Grimmett and Tiger O’Reilly, and had it not been for a magnificent 231 from Dudley Nourse together with some rain in the second Test, it would have been a 5-0 defeat. For Eric there were two solid innings of 66 and 49 in the First Test. The next two Tests followed quickly and with 38, 13, 12 and 19 he hardly disgraced himself, but six weeks later he was not in the side for the fourth Test. One wonders if, given his tendency to say what he thought, which certainly caused him problems later in his career, this might have been the first example of that. I have found no contemporary writings that bear that out, although Australian batsman Bill Brown wrote many years later; We enjoyed playing against Eric Rowan, who was quite a character. The next Test cricket for South Africa was also their last before the war, against England in 1938/39, a series won 1-0 by England, courtesy of victory in the third Test. Despite England being in front going into the final Test, by prior agreement, as the home side could still square the series, the match was to be played to a finish. It proved to be the last truly timeless Test ever played, and even then had to be left drawn after ten days play, as England had a boat to catch. At the end England, chasing 696 for victory, were 42 short with five wickets in hand. Eric had not been selected for the first Test, but played in the rest of the series. His undefeated 89 in the second innings of the second Test helped save the game after South Africa had followed on, and he scored further half-centuries in the next two Tests before, uncharacteristically, missing out in the run feast at the end. First Class cricket stopped in South Africa following the outbreak of war, but it continued just long enough for Eric to score the first triple century ever in South Africa, an unbeaten 306 against Natal. After that his war duties took over. He joined an armoured car regiment where he eventually rose to the rank of Lieutenant. In that 1939/40 season Eric was joined in the Transvaal side by Athol, just 18 years of age and enjoying the only pain free season of First Class cricket that he was to ever have. He showed huge promise, averaging 47 with the bat, and taking 19 wickets at 18.26 runs apiece. Then Athol too joined up, enlisting as a Private in the Transvaal Scottish Regiment. He was one of the many Allied infantrymen captured at Tobruk. Athol may well have regretted in later years that he managed to escape from his captors, as having done so he then went on an officer’s training course and it was whilst he was attending that he suffered the knee injury that leaves Hugh Tayfield without an apparent challenger as the finest South African off spinner to have graced the game. What caused the injury? I regret I do not know for sure. I have read that it was caused by playing rugby, or that it was an explosion from a mortar. Athol’s friend John Arlott described it as brought about by a barely noticed knock against a gun carriage. The truth I fancy is that it was the recoil from a mortar that caused the original injury, which was then aggravated by playing rugby. Whichever way it was caused it required three operations to remove and/or repair ligament, nerve, cartilage and fragments of bone. Athol never again played cricket without some support for the knee. On good days it was a bandage, and on bad ones a leg iron – yes, he played Test cricket wearing a leg iron. In 1945/46 First Class cricket lurched back into life all over the Southern Hemisphere. In South Africa Eric spent the season with Eastern Province, averaged more than 67, and scored 284 against Griqualand West – not the strongest opposition, but still First Class. Athol’s knee prevented him playing. The following season was important as on its outcome would turn the composition of the party to tour England in 1947. Athol grinned and bore his injury, and took 35 wickets at 15.45 in his five appearances. Five times there were five in an innings, and twice ten in a match. His was a certain selection. Eric started the season with an innings of 96, but then fell away and despite his past record was overlooked. In his preview of the tour for The Cricketer Louis Duffus, one of the best known South African cricket writers there has been, suggested the reason was that the selectors were keen to concentrate on youth, and that at 37 Eric didn’t fit in with their plans. His experience was sorely missed, as the selectors surely always knew it would be – the truth was that he and skipper Alan Melville did not get on – even Wisden, not an organ to court controversy, confirmed in Eric’s obituary in its 1994 edition that personality clashes had been the reason for his omission. In the final Test of the 1947 series South Africa ended up, with three wickets in hand, a tantalising 28 runs short of an improbable victory target of 451. To the visitors therefore the honours in the final Test, but by then they were 3-0 down in that famous summer when the sun shone all day and every day, and Denis Compton and Bill Edrich were always scoring runs. Athol was not spared the rod, his dozen wickets costing more than 55 runs each, but he bowled more than 250 overs, almost a fifth of them maidens, and on occasion troubled even the mighty Compo, particularly in an early season game at Lord’s when Arlott wrote On this form, Rowan …. was a worldbeater, before bemoaning the lack of confidence, certainly not a family trait, that caused him not to live up to the early promise. Athol was not much below medium pace, with a shambling run, remodelled after his injury to take account of the chronic knee problem. He had started his bowling life as a seamer, and delivered the ball with just his index finger on the seam. A complete turn of the wrist meant that the ball tended to move away from the right hander in the air, before breaking back in. Athol also had an excellent arm ball as well as what amounted to a leg cutter. In a wet English summer Arlott felt he would have wreaked havoc. As it was he still managed to take 102 wickets on the tour as a whole, at the perfectly respectable cost of 24.97. As a batsman Athol had come to England billed as an all-rounder, and indeed in the course of the tour he scored what was to prove to be his only First Class century, exactly 100 against Glamorgan. That apart however there was just one more score of over fifty, and although he got plenty of starts, his batting never quite made the transition from the hard fast wickets that he was used to at home. As to his fielding given the restrictions imposed by his knee Arlott’s comments probably say more about the general fielding standards of the day than about Athol himself; In the field he was, with the possible exception of Keith Miller, probably the finest cover point in the world. His shuffling gait and frequent inelegance in bending often obscured his speed and accuracy of throw. The home series against England in 1948/49 was the first time the brothers played together for South Africa. A change of captain from Melville to Nourse allowed Eric to resume his career, although he failed twice. Athol’s off breaks and the orthodox slow left arm of “Tufty” Mann bowled England out in their first innings. The game ended with England making decidedly heavy weather of a fourth innings target of 128, in pursuit of which they lost eight wickets. Perhaps Athol should have been given more than the four wicketless overs he was asked to bowl. The second Test was drawn. Athol had no luck with the ball and England piled up 608 in their first innings. Eric failed again in the South African first innings and at the close of the third day he was unbeaten on 17 as the home side set out on the long road to save the match. In those days the South African selectors, somewhat bizarrely, announced their side for the next Test before the end of the current one, so by the time he went out to resume his innings next morning Eric and the entire nation knew he had been dropped. He responded by batting out the day and remaining unbeaten on 156 as South Africa easily saved the game. He got in bother towards the end for a two fingered salute. He said it was a “V for Victory” sign. On it being pointed out that his hand was the wrong way round for that his rejoinder was that it was bound to look like that way to those he had his back to, and that he made the gesture to a friend who was on the opposite side of the ground to the selectors. On his return for the fourth Test Eric thwarted England again, this time an unbeaten 86 taking his team to safety. For Athol 1948/49 was his best series with the ball, 24 wickets coming his way at 33.08. His two five wicket hauls set up two good positions for his side and he had eight altogether in the final Test, a match that played out much like the first, this time England passing a target of 172 with three wickets to spare. The high point of Athol’s career came in December 1949 when Transvaal played Australia. The tourists’ batting had no discernable weakness, only last man Geoff Noblet really deserving to be called a tailender, and even he recorded a couple of fifties in his career. Home skipper Eric decided that the wicket would suit Athol and on winning the toss invited Australia to make first use of it. Athol took 9-19 as Australia were dismissed for 84. He then made the second top score of 31 as the home side took a first innings lead of 41. He was not quite so successful second time round, but his 6-49 still meant that his side needed just 68 to win. Sadly however Ian Johnson, Australia’s off spinner, then found his form and Transvaal ended up 15 runs short. Athol was there at the end, top scorer this time, unbeaten on 15, but he paid a price. The left knee collapsed at the end of the innings and he missed the rest of the season. The Test series that followed was one sided, Australia taking four of the five Tests and being well on top in the drawn fourth Test. Despite celebrating his 40th birthday before the series began Eric scored more than 400 runs and averaged 44, figures very similar to his captain, Nourse. None of their teammates showed any consistency at all, and in recording a century and three fifties. Wisden described Eric as having …… fought an unenviable battle with the abundant forces at Australia’s disposal. South Africa were due to tour England again in 1951, and the evergreen Eric was appointed vice-captain. For a long time it was believed that Athol’s career was over, and he did not played at all in the 1950/51 Currie Cup competition, but somehow he got his knee in shape to play in a trial match in February 1951, and he did enough then to secure his second trip to England. The first Test was played at Trent Bridge and ended in South Africa’s first Test win since 1935. Eric contributed little with the bat, but after Nourse had to leave the field it was his skilful bowling changes and field placings that meant that England fell well short of what had appeared to be a relatively modest victory target of 186. Athol took 5-68. After the euphoria of their victory the South Africans were quickly reminded of the frailty of their batting at Northampton where the home side forced them to follow on. That they drew comfortably in the end was due in large part to Eric who ended the game unbeaten on 202. He had batted right through the final day. There was no respite for tourists in those days and the very next morning Eric found himself opening the batting against Lancashire with John Waite. There were almost 15,000 people at Old Trafford on that sunny Saturday morning and they were expecting to be entertained, and were disappointed and frustrated as the South African openers accumulated only 66 runs in the first session. There were reasons for this. Rowan was tired after just batting for a day and a half at Northampton and he had a painful right arm which reduced the power he could put into his shots. Those issues aside Lancashire were not a side blessed by pace bowlers, but they had three international spinners. Bob Berry and Malcolm Hilton bowled their orthodox slow left arm to a packed off-side field, and Roy Tattersall’s off spin was also noted for its steadiness – all three conceded runs at a rate of barely two an over throughout their careers. As the afternoon session wore on the crowd became more and more restless and eventually, Waite finding his ability to concentrate being affected, the two batsmen simply sat down in the middle. The umpires later said that they had every sympathy with them. Coming so soon after a similar period of crowd behaviour during the first Test when an injury to Nourse curtailed his normal attacking instincts, Rowan was not a happy man. It might have been a moment for some humour to be injected, but instead there was just an eerie pause before the batsmen decided to resume. Rowan was out in due course and, perhaps surprisingly in the circumstances, was given a generous ovation, but on his return to the pavilion an insulting comment from one member prompted a vitriolic response, and a few minutes later, whilst lying on the masseur’s table, Rowan let forth something of a tirade against the crowd. He was in private and entitled to do so, but sadly a reporter was within earshot, and his comments caused something of a furore when published that evening. There was talk of the Tour Manager, former Test leg spinner Sid Pegler, sending Rowan straight home, but in the end, following skipper Nourse’s intervention, a public apology was deemed sufficient. The next two Tests were won comfortably by England so South Africa were 2-1 down when the fourth Test began at Headingley. 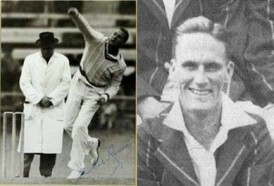 Nourse won the toss and batted and by the time Eric was out, after 9 hours and 35 minutes for 236, he had become the oldest double centurion in Test history. Unfortunately for South Africa however the wicket simply did not deteriorate, and England made 505 in reply to their 538, leaving just time for Eric to score a breezy unbeaten 60 before the game ended. In England’s first innings Athol had bowled 68 overs, taking 5-174. The fifth Test at the Oval was won by England again, but this time by just four wickets. In a low scoring game Eric, with 55 and 45, top scored in each innings, and there were four wickets for Athol, although morally it was five, Len Hutton being dismissed obstructing the field in the England second innings, after he had hit with his bat a ball that had risen off his glove, and which he instinctively thought might hit the stumps, when in fact it was destined for the safe hands of wicketkeeper Russell Endean. For both Eric and Athol the closure of the fifth Test marked the end of their Test careers, and in Athol’s case he never played First Class cricket again. Eric received a letter when he got home telling him he would not be selected again for South Africa. He was, of course, 42 by then, but he was still good enough. In 1952/53 the Springboks toured Australia, and contrary to all expectations drew the rubber 2-2. With Eric they might have done enough to win – he was back at home in South Africa, sticking two fingers up at the selectors again, by averaging almost 75 and looking as good as ever. Whilst Eric lost six good years to the war that was a realtively small proportion of his overall career and, had he had those lost years, one suspects that his batting average would not have ended up significantly different from the 43.66 it eventually finished at. For Athol there was a much greater loss, a handful of wartime matches apart his entire First Class career being confined within half a decade. As noted he was just 30 when he walked off the Oval pitch at the end of the 1951 series. He is, if ever there was one, a man whose statistics go no way towards reflecting his real quality, his overall record in fifteen Tests – all against England – being 54 wickets at a cost of 38.59 apiece. It was Athol’s misfortune to play nine of those fifteen Tests on plumb batting wickets, and on only four occasions did he have the chance to bowl on genuinely helpful wickets. Of those 54 victims 43 were recognised batsmen. Even without that strange dismissal at the Oval in 1951 he dismissed Hutton on 11 occasions. The mere fact that he played no more cricket in the final month of the 1951 tour is a vivid illustration of just how much pain and discomfort Athol was in throughout the tour, and it is clear from the way his trip went that the management’s real concern was just to nurse him through the First Class fixtures so that he could be wheeled out in the Tests – his long spells in the first and fourth Tests represented 25% of his bowling on the entire tour. Hutton considered Athol to be the second best off spinner he ever faced, putting only Jim Laker in front of him. The opposition for that accolade included Tayfield, Tattersall and Johnson. And Athol was a man who could never bowl just as he wanted to, his action dictated by his injury, and he never bowled, batted or fielded without pain or with full mobility – without that injury just how good might he have been?